My next big task is to run a huge three day training workshop in my franchising system and I’m really excited about this. I will take you through each of my seven key steps in detail and give you lots of other tips so you can get your franchise business up and running in a short time. 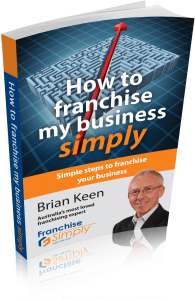 This workshop is a great introduction to our clear, simple step-by-easy-step system to franchising. People can take the information we give to franchise their businesses with little extra help. The workshop is over 9th, 10th and 11th September at the Q1 Resort on the Gold Coast. You want to franchise your business but are worried about the stories you’ve heard about huge fees, complex documents and problem franchisees. This three day training workshop is only $1397 per person. But because we really want to make this information available easily, the first 50 people to register, will receive the package at a very heavily discounted $997. two tickets for that amazing $997. You can book your spot now by registering below. Be quick, the spots are filling fast.